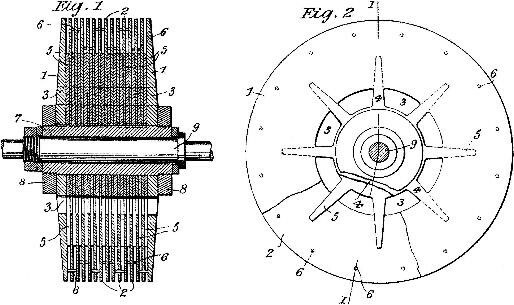 In a British Patent, Number 24,001 of 1910, I have described a bladeless turbine having a rotor consisting of discs with openings in the central portions and separating star-washers, these parts when assembled being riveted together into a single, solid structure and keyed to the shaft. This form of rotor operates satisfactorily but in long experience certain improvements in its construction have been found desirable and these constitute my present invention. In the new design I employ two heavier end-plates, which are machined tapering toward the periphery for the purpose of reducing the maximum centrifugal stress as much as practicable. The inside discs, of relatively thin material, are rolled, forged or ground tapering in like manner and with the same object in view, but this may not always be necessary and plates, made of sheet metal of substantially uniform thickness as furnished by the mills, can be employed. Each of the thick as well as thin plates is provided with exhaust openings, leaving a solid central portion like the hub and spokes of a wheel. Star-washers of similar configuration serve the purpose of keeping the discs apart in the center and for the peripheral spacing the thin plates have small holes drilled in them on a circle, or circles, of suitable diameter, and in these are driven tight-fitting studs which are upset at both ends by a special tool so that they will project beyond the metal on each side a trifle more than the thickness of the star-washers. When the plates are put together the separating studs do not come in line but are straddled in order to give opportunity for slight yielding, thereby eliminating constructional difficulties which might be caused by unevenness or other mechanical imperfections. Thus the rotor can be finished closely to predetermined overall dimensions and will run true on the outside even if the thin inside plates should vary a little in thickness or be slightly warped. To simplify this arrangement I provide only every second plate with studs, using plain ones between. Furthermore, with the object of cheapening the manufacture I dispense altogether with the former, accomplishing the spacing by means of small bosses or protuberances which are raised in the plates by blows or pressure and provide a die, practically reducing all the machine work on a thin plate to a single operation in a stamping press. The star-washers, while preferable, are not indispensable and may be replaced by round separating washers of a diameter about equal to that of the hub part of the discs. All the plates and washers are fitted on and keyed to a sleeve threaded at the ends and equipped with nuts and collars for drawing the thick end-plates together or, if desired, the collars may by simply forced onto it and the ends upset. The sleeve has a hole fitting snugly on the shaft and is fastened to the same as usual. This construction permits free expansion and contraction of each plate individually under the varying influence of heat and centrifugal force and possesses a number of other advantages which are of considerable practical moment. A larger active plate area and consequently more power is obtained for a given width, this improving efficiency. Warping is virtually eliminated and smaller side clearances may be used which results in diminished leakage and friction losses. The rotor is better adapted for dynamic balancing and through rubbing friction resists disturbing influences thereby insuring quieter running. For this reason and also because the discs are not rigidly joined it is safer against damage which might otherwise be caused by vibration or excessive speed.